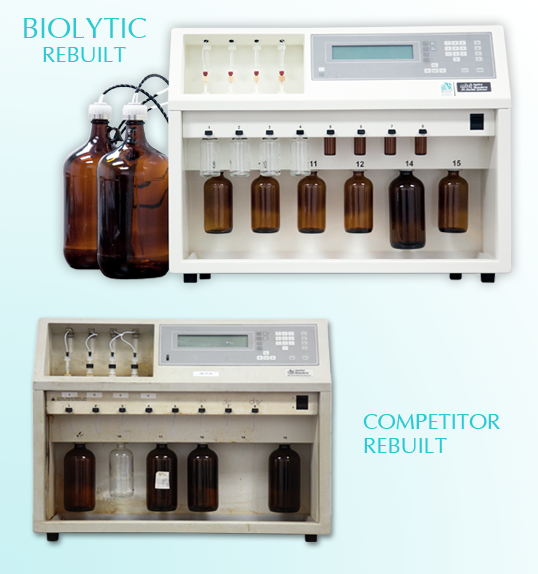 We rebuild and upgrade many of the popular oligo and peptide synthesizers on the market. Purchasing a rebuilt instrument can save time and money if done right. At Biolytic, we stand behind our rebuilt instruments with high quality parts and reputable service. We have rebuilt instrumentation using the highest quality parts the most stringent QC process for over 2 decades. We offer many high quality rebuilt instruments from a variety of manufacturers. We also offer a complete line of upgrades to customize your instrument to meet your needs. Some examples of customizations are: refitting different bottle caps, adding valves and plumbing to meet a particular need, etc. No request is too small or large. We offer rebuilds on most instruments we service and we offer upgrades on instruments. When rebuilding and / or upgrading an instrument we can also customize it to meet your needs. Some examples of customizations are: refitting different bottle caps, adding valves and plumbing to meet a particular need, etc. We are happy to discuss your instrument with you prior to getting it rebuilt. Contact our technical support team and we will help you diagnose your instrument. We may be able to provide some customer self-installable parts or offer troubleshooting tips that may fix the issue you are having. If a rebuild is necessary our sales team will provide you with a quote and instructions for sending in your instrument. When getting your instrument rebuilt we offer two options, send us your instrument to rebuild or do an exchange. Contact our sales team today for a quote to rebuild your instrument. We offer many different options and upgrades and will rebuild your instrument to factory specifications. We offer the opportunity to save money on your instrument service by making many instruments available for exchange. We send you a rebuilt and tested instrument and you send your defective instrument back to us. Exchange instruments must be returned within 5 business days of receipt for domestic orders and 10 business days for international orders. The instrument you are sending us for exchange must be returned fully intact. We understand that the item is broken due to normal use but we do not accept instruments for exchange that are missing items or have been disassembled. Instruments that are returned to us in a condition other than that described above will not be credited as a returned part. This means that you will be charged for the part without exchange. We have a proven track record and over 2 decades of experience in design and manufacturing of oligo synthesizers. All instrument rebuilds start with a full tear down of the instrument. We rebuild all valve blocks, the vacuum system, pneumatic systems, mechanical systems and replace all fluidic tubing (tubing that carries reagents), replace pneumatic, waste and vacuum tubing, as needed. We replace the bottle caps screw rings, all seals. For a full description of what goes into a rebuild or to visit our facility, please contact us. Our sales and technical team will work with you to provide you with an accurate quote to meet your needs. When requesting a quote, please specify your instrument model, type, rebuild options and any custom requests. Please request a quote online, by email, phone or fax.